AEM's X-Series OBDII Wideband UEGO AFR Sensor Controller Gauge (PN 30-0333) provides tuners who are using piggyback tuning modules or open source software with the ability to view AFR through the factory CAN-bus stream that is output by the factory ECU, and deliver the most accurate, safe and powerful tune. The 30-0333 X-Series OBDII Wideband Gauge is verified to work with HPTuners, EFILive and DashDaq, with more applications being validated. OBDII CAN-bus OUTPUT The OBDII output simulates an auxiliary ECU signal when plugged into a vehicle’s OBD port, which requires a unique address from the other ECUs already on a vehicle’s network. AEM’s default OBDII CAN address will work with most popular vehicles and adjustments should not be necessary. 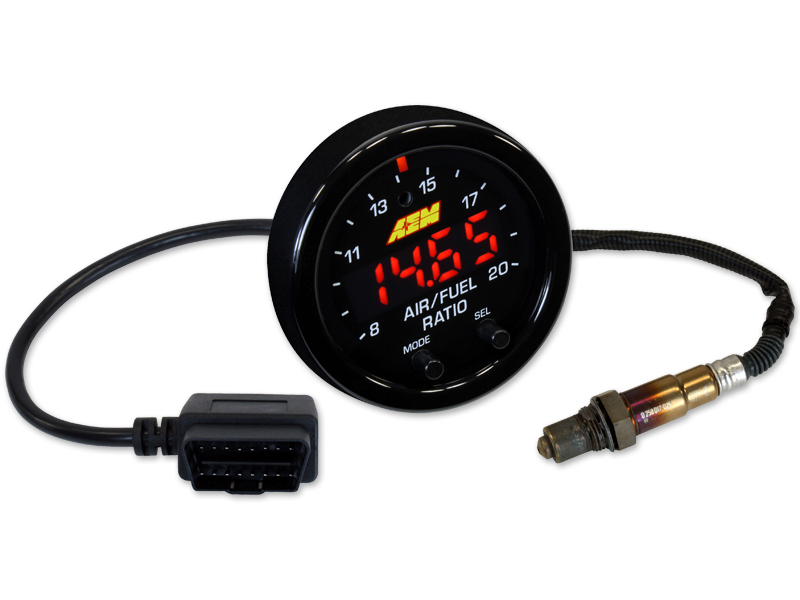 However, AEM has provided OBDII address programmability through the buttons on the gauge face if a different address other than the default address is required, allowing users to program ECU #, Parameter Identification (PID), Message Identifier, and Bit Rate.